Nationality: American. Born: Gwyneth Kate Paltrow, Los Angeles, California, 28 September 1972 (some sources say 1973). Education: Dropped out of University of California to pursue career in acting. Awards: Academy Award, for Shakespeare in Love , 1998. Address: Creative Artists Agency, 9830 Wilshire Boulevard, Beverly Hills, CA 90212–1825, U.S.A.
Rochlin, Margy, "Like Emma, Setting Her World All Astir," in The New York Times , 28 July 1996. Corliss, Richard, "A Touch of Class," in Time , 29 July 1996. Holden, Stephen, "A Second Chance at Love," in The New York Times , 25 April 1998. Maslin, Janet, "Shakespeare Saw a Therapist?" in The New York Times , 11 December 1998. With her unconventional beauty, mastery of accents, and class, Gwyneth Paltrow has a chance to become her generation's Meryl Streep, provided either experience or training greatly deepen her ability to lose herself in a role. Though she is not formally trained, her acting has gradually improved over the years. And though she was born and raised in California by her parents, actress Blythe Danner ( The Great Santini ) and television producer Bruce Paltrow ( St. Elsewhere ), she has shown herself to be a master of accents, from Texan ( Flesh and Bone ) to three distinct varieties of British in her three most notable films: Emma , Sliding Doors , and Shakespeare in Love. Director Steve Kloves was stunned by both Paltrow's acting ability and her ear for accents when he was casting the role of Ginnie, an amoral grifter from Texas who steals jewelry from corpses, for his film Flesh and Bone (1993). Kloves said, when Paltrow entered the audition room, she was all sweetness and light, "but as soon as she read, a veil came over her and she totally inhabited the character." Another director who can attest to the authenticity of her accent is Douglas McGrath. "I grew up in Texas, and my friends and I used to just kill ourselves laughing when movie actors did Texas accents. People always sounded like the Clampetts. But Gwyneth did the most impeccable Texas accent in Flesh and Bone. " This was one reason McGrath gave Paltrow the lead in his film Emma (1996), which proved to be her true breakout role. Emma , based on the Jane Austen novel, tells the story of an overindulged rich girl who is so busy meddling in the lives of others that she neglects her own. 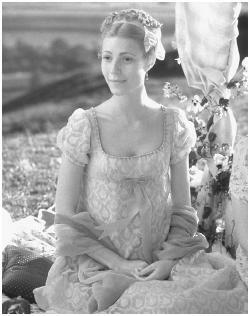 As an American, Paltrow was petrified of taking the role of one of England's most beloved literary characters, in a film to be shot in England and filled with some of England's finest actors. According to Paltrow, growing up she always had a knack for accents, and would occasionally fool people pretending she was British or some other nationality. But when she was cast as Emma Woodhouse she suddenly realized it would take an enormous amount of work because there's a huge difference between the fake English accent that sounds good and a real one that reflects growing up in a specific location in England, and that requires changing the placement of your tongue and jaw. She needn't have worried about tackling the role; her accent and the emotional tone she struck were so right, so light and graceful and witty, that her performance was embraced on both sides of the Atlantic. She was offered roles in Titanic and The Avengers , but turned down both for the lead in Peter Howitt's Sliding Doors (1998), in which she plays the lead character in a dual role. Running for a subway train after being fired from her job, Helen Quilley both catches and misses the train, setting up parallel stories showing how something as simple as catching or missing a subway train can lead to widely divergent fates. A great believer in the idea that life experiences really change the way you perceive things from one day to the next, Paltrow found it challenging to play two versions of the same woman, one who has been through something dramatic and traumatic, and one who hasn't.